Custom and Cheap CE approved new professional mini home ipl hair removal machine Supplier and Manufacturer.--Ningbo Ruipu Electronic Technology Co., Ltd.
Ningbo Ruipu Electronic Technology Co., Ltd. 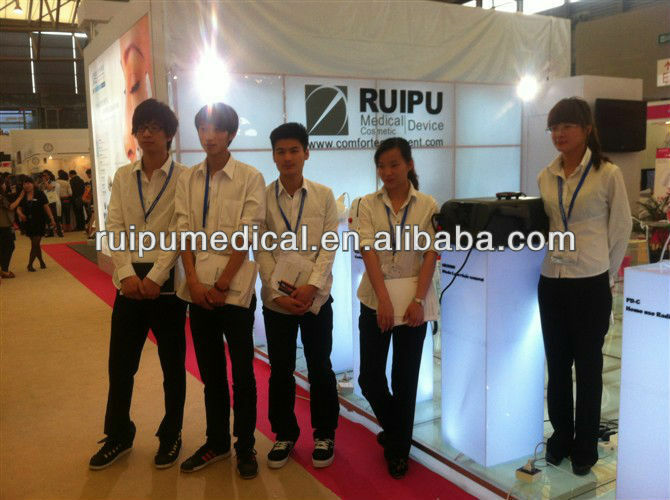 Custom and Cheap Beauty Machine,IPL,Cavitation,RF,cryolipolysis fat freezing Supplier and Manufacturer. IPL (Intense Pulsed Ligh). It is a kind of light with high energy and broad wavelength, ranging from 475 nm to 1200nm. Intense Pulsed Light affects pigmentations, broken capillaries and hair follicles with its specific wavelength and high energy. 1.Everlasting hair removal: remove unwanted hairs under arms, on legs, lips or other body parts, etc. 2.Pigmentation treatment: remove various kinds of pigment such as freckle, chloasma, aged spots, sunburn, etc. 1.Gentle enough for all body treatment, no side effects. 2.Entire cooling system makes the treatment more comfortable. 3.Interchangeable filters for different treatment item and easy cleaning. 1.Does Ellipse hair removal work? Yes. In clinical trials held by physicians,Ellipse hair removalwas proven to safely achieve excellent hair removal results. Ellipse hair removal has the FDA clearance for the removal of unwanted hair. In addition, Ellipse hair removal is not required by FDA clearance to be used with other products. 2.How do I bypass the energy levels beyond "Level One"? For your safety, when Ellipse hair removal is being used for the first time, the system is automatically set to deliver the first 50 pulses at the lowest energy level, and the next 200 pulses at up to level 3. To cancel these settings press and hold the "+" and "-" buttons simultaneously until you hear 2 consecutive "beep" sounds. We suggest you start your first Ellipse hair removal hair removal session at the lowest energy settings. If you experience no discomfort after the hair removal session, raise the energy level by one indicator light at the next session, and so on for each subsequent session. 3. I have fair skin, why is the skin sensor warning light on? Sometimes the skin sensor can be affected by the room in which you are treating. Treatments in a dark room or a room with a bright light (such as lamps and vanities) can cause the warning light to turn on. This is a result of a shadow being cast on your skin making it appear darker than it really is. To prevent this from happening - treat in moderate lighting. If you continue to have a problem, make sure the sensor (located beside the yellow applicator light) is flush against the skin. 4. Why does the website say I can use Ellipse hair removal on my face below the cheek bone however my brochure says it is not recommended for use on the face? After two years of studying market data we have determined that Ellipse hair removal can be used safely on facial areas below the cheek bone. We are currently in the process of reprinting brochures to reflect this change. We apologize if you received a brochure that has not yet been updated. Please continue to check with our website for the most current information. 5. What are the Skin Color Sensor and other safety features? Ellipse hair removal comes with a built-in Skin Color Sensor that is designed to measure the skin tone of the applied surface and enable application only on suitable skin tones. This unique safety feature will not enable treatment if your skin is too dark or too tanned, taking the guesswork out of treatment. Ellipse hair removal has been designed with your safety in mind, tested and approved by top dermatologists and plastic surgeons to meet their safety standards for a home-use device. But, like any skin product or electronic device, one must use it according to the operating instructions and user precautions. The applicator tip ofEllipse hair removalhas been designed so that a light pulse can only be emitted when the applicator is in contact with the skin. This eliminates the possibility of an accidental flash of light directed towards the user’s eyes. 6. How can I maximize my treatment results? 1. Start with clean, shaven skin - NO WAXING. 2. Progress quickly to higher energy levels - once you have tested all treatment areas on the low energy setting, we recommend you move to higher levels. As a safety feature, the system is designed to provide the first 50 pulses at level one. To unlock the energy levels, press "-" and "+" simultaneously until you hear short consecutive beeps. 3. Schedule your treatments in two-week intervals. Typically, you will see results after the 3rd or 4th treatment - after this you can start treating monthly. 7. How long does a treatment session take? The time can vary depending on the area of the body treated. Two full legs can take up to 30 minutes or two underarms could take less than 10 minutes. Since the device does not require batteries, it can be used for any length of time. You should never feel rushed to complete a full treatment of the desired area. 8. How often should I use the device? Treatment sessions withEllipse hair removalshould be spaced every two weeks for the first three to four sessions. After that, treatments should be done if hairs have grown back and until the desired results are achieved. The total number of sessions varies from person to person but in general, most individuals notice a reduction after four treatments, with very good results after six treatments. Most females require eight full sessions. Males tend to have more stubborn and deeper hair and may require ten to twelve treatments. 9. Is it effective on white, grey or blonde hairs? Treatments work best on darker hair types or hair that contains more melanin. Melanin is the pigment that gives hair and skin color and absorbs light energy. Black and dark brown respond the best, although brown and light brown hairs will also respond, but typically require more treatments. Red may show some response. White, grey or blonde hairs usually don’t respond as well to treatments. However, some users have noted results after multiple treatments. For more information on why certain hair types respond better than others, please refer to theEllipse hair removalinstruction manual. 10. Can I useEllipse hair removalon brown or black skin? Do not use Ellipse hair removal on a naturally dark complexion. Ellipse hair removal removes unwanted hair by selectively addressing hair pigment. Varied quantities of pigment also exist in the surrounding tissue of skin. The quantity of pigment in a particular person’s skin, which is manifested by their skin complexion, determines the degree of risk they are exposed to using Ellipse hair removal. Treating dark skin can result in adverse effects, such as burns, blisters, and skin color changes (hyper- or hypo-pigmentation). Many other laser and light devices, professionally and at home, also have the same restrictions on dark skin. 11. When will I see results from Ellipse hair removal? As with any light-based or laser hair removal device, results are not immediate. In fact, you may not think anything has happened all. Most users see a noticeable reduction after 4 treatments. Each time you treat, you should increase the energy level. It is important to be patient and consistent during your hair removal process, as hair may sometimes appear to be growing back after a treatment, but typically after two weeks, many of these hairs will simply fall out. It is also important to understand the hair growth cycle. Hair grows in three different stages and only hairs in an active growth stage will be affected by aEllipse hair removaltreatment. This is one of the main reasons that multiple treatments are required to achieve the desired result. 12. Are there side effects from using Ellipse hair removal? When used properly, most users ofEllipse hair removalreport feeling a slight sensation of heat when the pulse of light is emitted. Side effects and complications, while possible, are not common if Ellipse hair removal is used according to the instructions and precautions included with the device. Please read these instructions before beginning treatment. In clinical studies a small fraction of users reported some sensation of heat, redness around the hair shaft, and slight swelling. These conditions usually subsided within an hour after treatment. For more information on side-effects and how to avoid them, please read the Ellipse hair removal instruction manual. 13. Can a men use Ellipse hair removal? Yes, Ellipse hair removal may be used by men, although hairs on men, especially those on the chest, will require more treatments than those of women to get the desired results. 14. Why is my hair growing, even though I treated it a week ago? It is quite common for hair to appear as if it is still growing up to two weeks after a treatment with Ellipse hair removal. This process is known as “ejection” and at around two weeks, you’ll see that these hairs simply fall out or slide out with a slight tug. (We don’t recommend pulling on the hairs – just let them come out naturally). It is also possible that some hairs, due to missed treatment or different stages of growth, were not affected by the Ellipse hair removal treatment. These hairs will be treated in follow-up sessions, hence the need for multiple treatments in order to get the best results. 15. I’ve heard that some hairs grow back lighter and finer after light treatment? This phenomenon is well documented amongst aestheticians and doctors using light and laser devices for hair removal. It is possible that some hairs will grow back lighter and finer after treatment. Usually these hairs are a fraction of what was originally there, and continued treatment may have a desirable effect on them. 2.Ship by Normal air to airport need 5-7days. 3.Ship by sea from Shanghai port need more than 30 days. 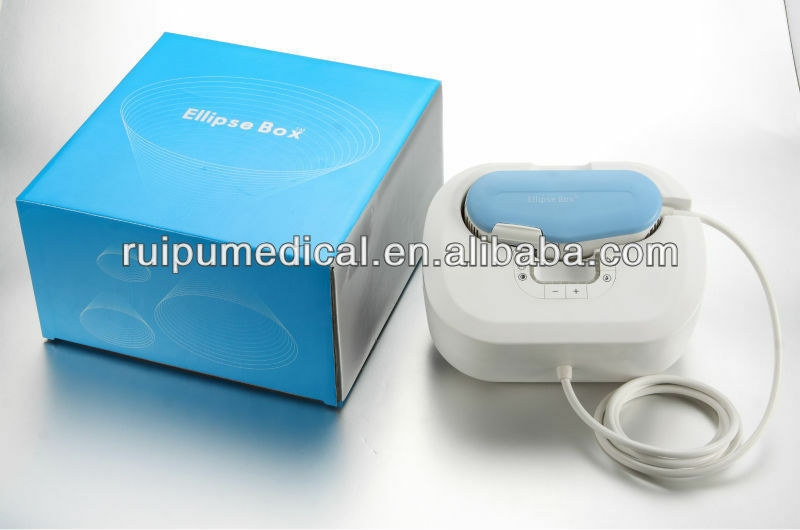 We are the leading aesthetic device manufacturer in China with more than 10 years history. We speilized in rearching&produing variety kinds of beauty salon machine , including, IPL machine, laser diode machine, ND-YAG Laser for tattoo removal, Lipo Laser for body slimming, RF (Radio Frequency) system, E-Light, Ultraosnic cavitation system, Cryolipolysis system and Co2 Fractional laser system. What’s more we also produce home use personal care machine such as home use ipl , home use cavitation and home use rf .All products have got CE & ISO13485 certificate. We provide high quality products with reasonable price and outstanding after-saleservice. All ofour aesthetic products can help your clients obtaina more youthful appearance.